JEE Advanced 2018 is closed Now. JoSAA declares first seat allotment results. JEE Advanced 2018 notice for counselling schedule has also released. Also, The exam will be conducted in online (computer-based test) Mode only. 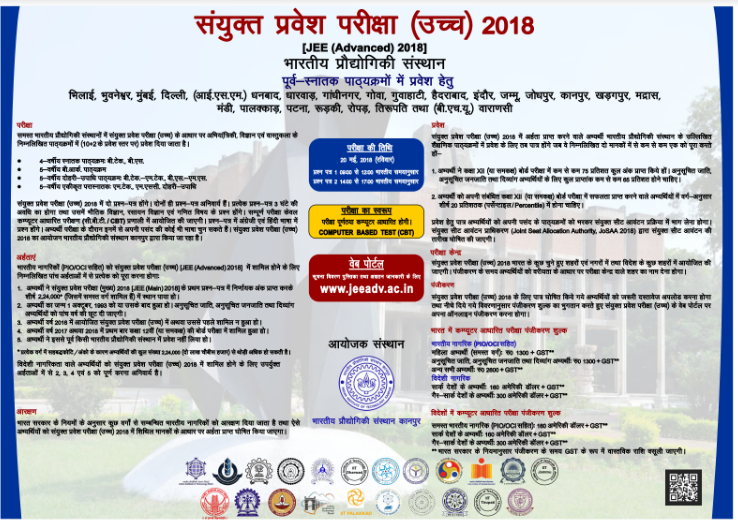 IIT Kanpur with JAB (Joint Admission Board) will together be conducting JEE Advanced 2018 exam this year. Also, JEE Advance qualified applicants will get admission in 4-year Bachelor of Engineering at 23 IITs (Indian Institute of Technology). 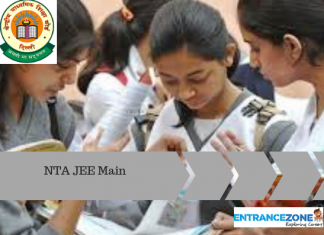 Further, JEE Advanced is a second stage examination proceeded by JEE Main Exam. Moreover, the applicants can sit for this exam 2 times in consecutive years. Over 12 lakh candidates participated in JEE Main 2018 out of which, only 2.24 lakhs are qualified for JEE Advanced. Whereas, JEE Main examination dates are released by the CBSE i.e. 08 April 2018 and 15-16 April 2018. 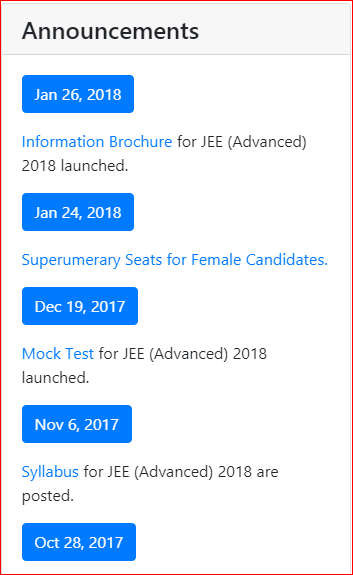 JEE Advanced 2018 Information Brochure along with all official dates released by Joint Entrance Examination (Advanced) conducting body. The unofficial answer keys are released and available here. Check JEE Advanced 2019 Updates Here. JEE Advanced 2018 exam, the candidates will have to be eligible in some ways. They need to be born on or after 1 October 1993. Also, they need to get a good enough score with the rank less than the cutoff rank in JEE Main 2018 exam. The rank also includes different categories for different candidates. Frequently Asked Questions (FAQ) for JEE (Advanced) 2018 are uploaded and the official link is attached below. JEE Advanced 2018: Partially Registered Candidates get Second Chance for Registration. IIT-JEE (Advanced) goes fully digital. And the examination will be conducted online only. 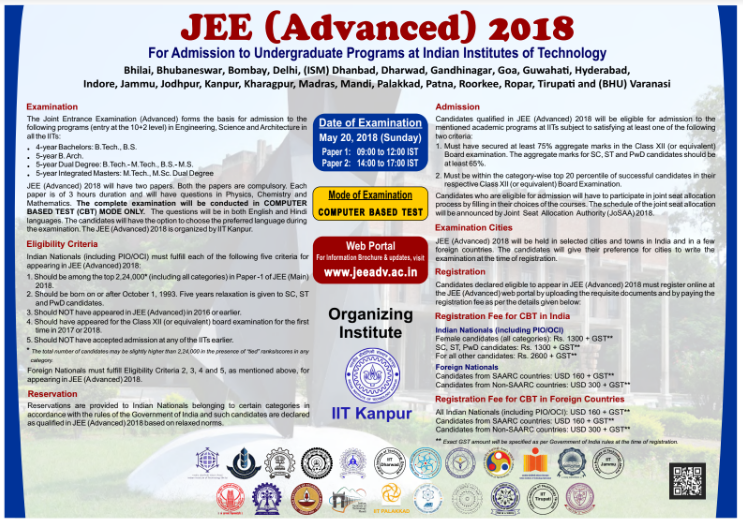 The IIT Kanpur released the JEE Advanced 2018 information brochure on 26 January. Whereas the information brochure pdf is attached below. And Supernumerary Seats for Female Candidates are increased from 8% to 14% from 2018-19 session. Finally, Six Mock Tests are released at Advanced Website. (Official Link Given Below). Firstly, this examination is open to both Indian & abroad applicants. Also, the important dates and schedule have been declared by zonal IITs representatives officially in October 2018. But before that here is a tentative schedule to give an idea about the tentative dates for various events related to JEE Advanced 2018. Firstly, CBSE has uploaded JEE Advanced 2018 Answer key pdf online on 29 May 2018. Then, the students can check their answer. Also, match it with the correct response to calculate their score. Further, the candidates can also send the remarks on answer key in the 1st week of June 2018 itself. Finally, the answer key provided by CBSE will be considered final. JEE Advanced 2018 Registration: Who are all eligible to fill the JEE Advanced Application Form? The application form for Jee Advanced 2018, a second stage examination for aspirants seeking admission in IITs, NITs etc. only top 224000 qualified students of Jee Main 2018 are eligible to appear in the Joint Entrance Examination (advanced). The Online Application will be available after Main Entrance Examination result declaration. Recently the number of eligible candidates is increased by 4000. jee advanced candidate login page will be available from April onwards. In order to enrol for JEE Adv. exams, the student must have qualified the JEE Main. Also, this is the only imperative criteria as such. Also, the registration process will commence in the last week of April. Before applying, the candidates need to create their account online, register and after that, fill the application form. But, one needs to fill it properly and authentically. PWD (in each of the open, OBC-NCL, SC & ST) candidates – 3%. Joint Entrance Exam Advanced is the most sought-after National Level Engineering Entrance Exams in India. And it is directed by the seven zonal IITs under the supervision of the Joint Admission Board (JAB). Further, There are 2 papers in the exam and both are mandatory. And, the online registration will begin on 28 April. The JEE Advanced Exam date is fixed and it is on 20 May. Moreover, the exam date will not be changed under any circumstances. Finally, the result will be declared on 11 June and the counselling process will begin a week post result declaration. Hence, the candidates must keep visiting the official JEE(Advanced) portal regularly. What are the eligibility criteria for JEE Advanced Exam? This question is asked by almost all aspirants as not all the JEE Main passing candidates are allowed to give this exam. Thus we have prepared a list of the eligibility requirements for the exam. All the candidates must fulfil the following five criteria to appear in JEE (Advanced) 2018 and further to take admission in IITs. Each candidate must appear and should be among the top 2,24,000 (including all categories) in JEE (Main) 2018 Paper-1 with positive marks. Note: Within each of these four categories, 5% horizontal reservation is available for PwD candidates. The number of eligible candidates is increased from 2.20 lakh to 2.24 lakh for JEE 2018 (Advanced). 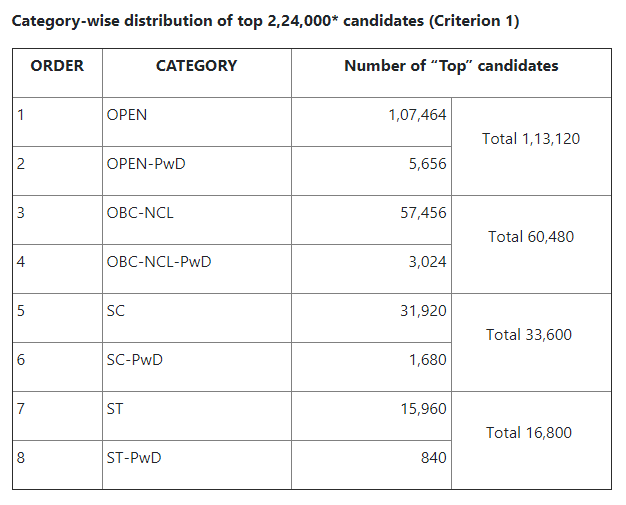 The Category-wise seat distribution of top 2,24,000* candidates is given below. Note: In the case of “tied” ranks/scores in any category, the total number of candidates appearing in Jee Advanced 2018 may be slightly greater than 2,24,000. Applicants of General category must be born on or after October 1, 1993. However, there will be the exemption of 5 years age relaxation for PWD/SC/ST categorized student. Moreover, the DOB must fall on or after October 1, 1988, to qualify for JEE Advanced 2018. Criteria 3: Number of Attempts in Joint Entrance Exam. Applicants are permitted to take JEE Advanced Exam for Maximum of 2 times in a row ONLY (Consecutive years). Criteria 4: Number of Attempts in Joint Entrance Exam. 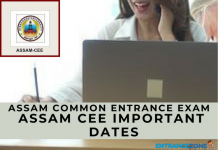 Hence, the candidates who appeared in the Class XII (or equivalent) examination in 2018 or 2018 for the 1st time are eligible. Criteria 4: Educational Qualification or Appearance in Class XII (or equivalent) examination. Applicants must have attended class 12th or its equivalent board exam in the year 2018 or 2018. Also, applicants whose class 12th or equivalent exam result (2016-2018) was issued after June 2018 can apply. Note: For 2016 candidates read the exception case here. Eligibility Criteria for Indian Nationals (JEE Advanced 2018). Criteria 5: Earlier admission at IITs. Eligibility no. 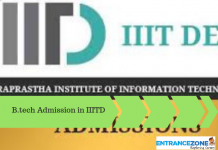 5 Earlier Admission at IITs. First and foremost, from 2018, JEE Advanced paper will be conducted in fully computer-based test (online mode only). This decision has been taken by the conducting authority to provide greater transparency, prevent chances of errors in the question paper and avoid paper leaks. Moreover, it will give a chance to the candidates to change their answer after they have entered their choice. Accordingly, this decision has been taken while keeping the benefit of students in mind. However, the JEE Advanced Syllabus contains XI and XII standard Chemistry, Physics, and Mathematics. So, check out the important chapters related to JEE Advanced Syllabus. Please download JEE Advanced Syllabus PDF with weightage. The JEE Advanced Exam Pattern is described below. There will be 2 papers in JEE Advanced each of 3-hour duration. Also, it is mandatory for shortlisted applicants to appear in both the papers. It is very imperative for the candidates to appear in both papers of JEE Advance. Further, there is 54 question of 186 marks in both the papers. Also, the three subjects are namely Physics, Chemistry, and Mathematics. The question paper will have MCQs and numerical type questions. Also, Negative Marking is applicable to some questions. Finally, the language of question paper in English and Hindi. Also, the candidates need to choose the preferred language at the time of registration. Also, candidates must note that both the papers 1 & 2 are compulsory. Moreover, the concerned authority of IIT Kanpur (organising body) for JEE Advanced has not declared the exam pattern for 2018 yet. The Information Brochure is coming soon. JEE Advanced Admit Card/Hall Ticket are available on the official portal. And, the candidates who have filled the form properly can download it. Moreover, the admit card contains details such as Name, Exam Center Details, paper name, signature, photograph, correspondence address, preferred language, and category etc. And, candidates must check the details carefully before downloading. Therefore, candidates should contact the concerned authorities if there is an error in the admit card. 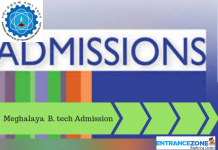 Moreover, the applicants have to keep a copy of admit card till the admission process will get over. Also, the candidates can choose three cities as per their convenience at the time of filling the application form. Furthermore, Dubai is the international exam centre. Also, each candidate needs to pay USD 220 to opt for it. The result for Joint entrance exam advanced will be announced somewhere in June 2018. And AIR (All India Rank) along with merit list of selected candidates for counselling will be published. Whereas, category wise AIRs are published on the official website and link will be available on this page. Counselling will be started from 18 June 2018. Firstly, Joint Seat Allocation Authority (JoSAA) is the conducting body for the counselling process. Also, the counselling process is centralized in nature. Moreover, the successful candidates have to attend the counselling process for seat allotment and admission in IITs, ISM, NITs, and other Govt. Supported Technical Institutes (GFTIs). Finally, JoSAA will publish the calendar for the joint seat allotment allocation separately. The Joint Entrance Examination Advanced 2018 brief information is mention here. Level of Exam: National Level Entrance Exam for admissions to IITs. Mode of Exam: Online (computer-based test) only. Colleges: 23 IITs & IISC. Note: The jee mains and the advanced exam is regulated by joint admission board jab (Joint apex body) and JoSSA (Joint Seat Allocation Authority) set by MHRD. And the decisions of the JAB 2018 will be final in all matters related to JEE (Advanced) 2018 and admission to IITs. The FAQs are based on questions generally asked by aspiring candidates. Q1. How many students qualified for JEE advanced 2018-18? Ans. The number of students qualified for jee advanced 2018 is 50,455. Whereas 220000 students appeared for the Advanced exam after qualifying the Main exam. Success rates of candidates, Boys: Girls are given here. Q2. How many students can qualify for JEE Advanced 2018? Ans. Only the top 2,24,000 candidates including all categories will be selected to appear in this year’s JEE Advanced examination. Q3. How many students are selected in IIT every year? Ans. Around 30,000 candidates are in IIT through Joint Entrance Exam conducted by CBSE, JAB and JoSAA. Moreover, JEE Advanced 2018 Information Brochure is available on this site as well. 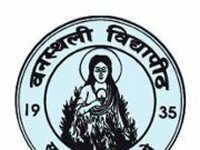 The mock tests are released by examination conducting body, Indian Institute of Technology, Kanpur. The “Help Video for Mock Test and CBT” is also released and available at official website. The Hindi and English posters are released by advanced exam conducting body. These posters contain all the details of Joint Entrance Examination (Advanced). jee advanced 2018 date, jee advanced 2018 exam date, jee advanced official answer key 2018.